As we now have information that 5.5 EC-1 became US-42, the search for original or alias of I-34 is on again. A new proposal: The Swedish list of 5.5's is having S-34 and S-35 listed on them, which never showed up with ownership data, there. Theory: Both boats were sold to Italy and for easyness, the "S" was changed for an "I". As far as the Kungsörs site is stating, no boat was built for Italian account in 59/60. However the boat built for Ecuador (EC-1) which then never showed up in races, could have become I-34. She was designed by Br Ohlson and built by Schelin at Kungsör, Swe. First owners were Claes Turitz and Bengt Sjösten. 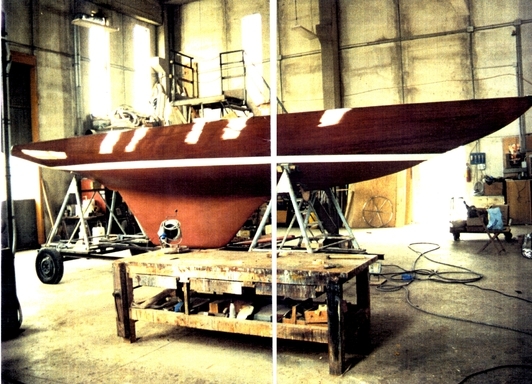 Turitz named his boat Ian and Sjöstens boats were Sha-Sha, so this co-owned boat became Iasha.